Each birthday brings a reminder of the love, happiness, and blessings another year of life has given. I like to use my birthday as a time to celebrate me and allow others to do so as well! After all, I think I deserve it! My birthday always starts off on Valentines Day. 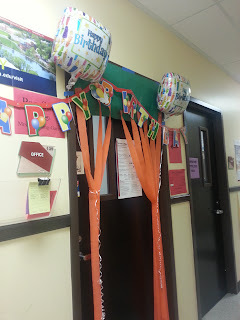 My co-workers had decorated my office door so everyone who passed by was encouraged to greet me "Happy Birthday". At home, my husband knows chocolate covered strawberries is all I need to complete the day! But of course, we also engaged in the obligatory Valentines Day dinner with our boys in tow! Tom yum soup and chicken pad Thai gave us for happy tummies and a complete Valentines Day with the three loves of my life! My birthday eve, birthday day, and post-birthday were spent in Viva Las Vegas! We loaded up a 15 passenger van with Garcia Family and my in-laws and drove up Interstate 15! My Mama is 91 years old. She is strong, still has her wits about her, and is as healthy as a 91 year old could be! When I think of her 12 children, 40+ grandchildren, and over two dozen great-grandchildren, I am in awe! I can't imagine having 12 children all no more than two years apart. I can't imagine what it would be in a cycle of being pregnant and having babies for over 15 years. 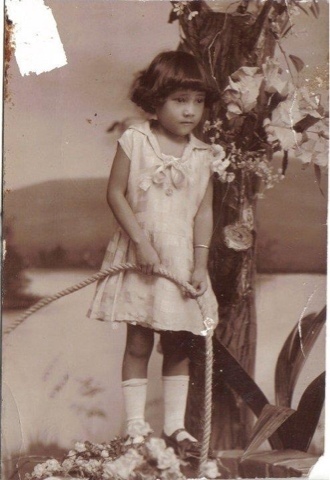 Today's Throwback Thursday is for my Mama for maintaining her sanity as best as she could amidst the diversions of raising 12 very unique, at times difficult, but most importantly loving, children. Garcia family headed over to Mason's Star Wars birthday party earlier this month! Mason is the son of one of my oldest and dearest friends, Heather. Heather and I have known each other since the first grade! It amazes us that we now have kids that are about the same age we were when we met! Check out the cute decor Heather and her team put together! 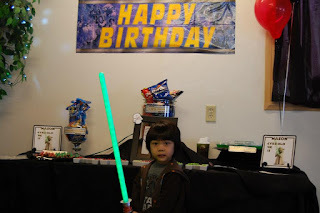 Mason had no idea a "real Jedi" was going to visit his party. He was completely surprised when the Jedi arrived. The Jedi explained to Mason and all the other kids that he was there to train them all to be Jedi. He also warned them all that he had heard Darth Vader had been seen lurking around the neighborhood! Each of the kids took turns training with the Jedi one-on-one, light sabers and all. My four year old's Google+ oops! Since he was a few months old, my son has always been a fan of electronics! When he was 18 months, we had gone on a cruise for a family vacation and my son came to be known as the "iPod baby" by other vacationers we were on the cruise with. He is a few weeks away from his five year old birthday and he knows how to navigate an iPod, iPhone, iPad, Android smartphones, and Nexus7 tablets. Thanks to these technologies, my son quickly learned his shapes, colors, letters, numbers, and has picked up the ability to read easily. Daddy Garcia works in the computer industry so we have all kinds of electronics around the house. This my son has come to be familiar with all of the computer devices. He's been begging for a Windows phone for this birthday. He quotes the Windows 8 ads about it being the "fastest", "newest", and "greatest" smartphone out there. There is no way he's getting a phone, but I have to admit he does know lots about it! It's almost Valentine's Day! This holiday is such fun for young ones! Hearts, cupid, candy, and more. Making valentines cards for classmates is an annual tradition we all remember doing as kids! This year, why not make it extra special with some lovely tunes to help your kids get into the Valentines spirit! 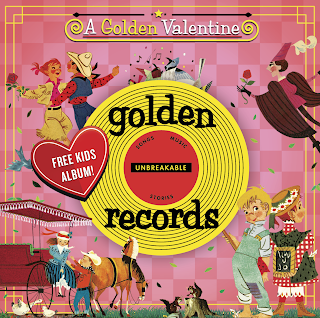 "A Golden Valentine" is a collection of 10 handpicked songs for children, including 3 bonus celebrity performances including 3 free celebrity performances from Busy Philipps (Cougartown), Cheryl Hines (Suburgatory) and Didi Conn (Grease). The Golden Records collection recaptures the nostalgic music of yesteryear, creating a collection of beloved instant classics for families to enjoy together. I'm happy to share that Golden Records is offering a free sampler download exclusively for their Golden Friends, you! Enjoy! Psst! Looking for Valentines Day Gift Ideas For Your Lady? This post is for the guys! Let me help you plan ahead to impress your lady this Valentines Day! I received my first Pajama Gram a few years ago from my hubby! It comes in a cute fabric box you can reuse. The pajamas are super comfy! They range from full coverage PJs for your conservative ladies and the less coverage PJs for your liberal ladies! Push to much or not hard enough?